LOCALS wanting something different for dinner tonight can choose between several food vans which have popped up in the town centre tonight. There are two vans and a busker outside the New Norfolk Post Office in High St tonight and another food van can be found in Burnett St outside the Chinese therapy shop, roughly opposite McDonalds (don't be put off by it looking like an SES van). Several local businesses are also open later than usual, with plenty of food options in the pubs and takeways too. 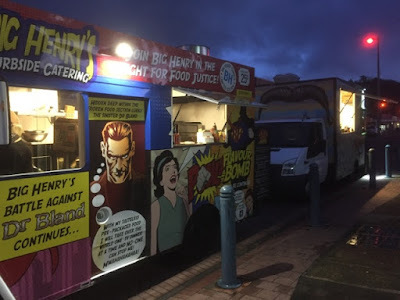 The food vans have been organised by the Derwent Valley Council in support of the Dark MoFo events in New Norfolk but no schedule has been provided, so going up the street is bound to bring a few surprises over the next week or so. * A New Norfolk News reader suggests that Van Demons Cafe de Wheels and GASPmobile food trucks will be in town on Monday. Food vans outside the post office in New Norfolk tonight.